668 COLOURlovers viewed this page and think 1335sj deserves a blue ribbon. Wow, thank you so much for kind words :))) You're work is outstanding, it really means a lot to me :))) Thanks again. 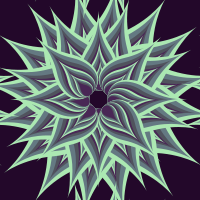 I LOVE how striking this pattern is - how your chosen colors caused the flower to glow. Spectacular work! Credit must be given to 1335sj & sunmeadow.